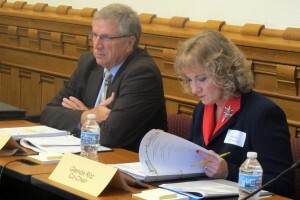 State Superintendent Glenda Ritz, right, and Southwest Allen Schools Superintendent Steven Yager co-chair the panel reviewing Indiana's A-F accountability system. To date, the panel rewriting the state’s A-F accountability system has spent three meetings discussing on how Indiana should measure student growth moving forward. Right now, schools receive bonus points based on how much their students are growing compared to their peers across the state. But this spring, the Indiana General Assembly threw out that system, telling state education officials to instead focus on measuring individual student growth. So the panel has been talking about how to calculate that measurement. But as one member pointed out Tuesday, the group only has until Nov. 1 to make that recommendation to the State Board of Education. Redelman asked when the panel would be able to see some statistical pieces. State Superintendent Glenda Ritz, who is co-chairing the group with Southwest Allen County Superintendent Steve Yager, told Redelman the focus right now is on creating the conceptual framework. Ritz and Yager told StateImpact last month the plan is to have a working model to send to the State Board for review. But Ritz told Redelman that may leave some statistical work to be done after the Nov. 1 deadline. The State Board is planning to meet twice next month to consider the recommendation of the panel, since the state legislature has given that group a Nov. 15 deadline. It’s possible the State Board could go a different direction than the panel, but at least one education policy watcher doesn’t think that’s likely. “I can’t imagine the State Board not taking seriously their recommendation, given the make-up of the commission,” says David Dresslar, the executive director of The Center of Excellence in Leadership of Learning at the University of Indianapolis. Having these representatives appointed by these various officials really puts this whole process in the sunshine and causes their deliberations to be public. They have a gargantuan task ahead of them, but as a group, I think they’re very much up to it. I think many of the issues that have been discussed with regard to A-F have been discussed for a couple of years now. It’s not like it’s new territory that we’re exploring. It’s territory that we explored. What’s new is that we now have a commission that’s going to make recommendations — and it’s a bi-partisan commission.